Although the mall is walking distance, you may take taxis if you do not feel comfortable walking to your destination. Another reason why the Quest Hotel & Conference Center in Cebu is a great hotel is that there are many taxis constantly available right outside the door. The taxis can take you anywhere you wish to go. If you have any questions or concerns, the Quest Hotel staffs are more than happy to help and assist you in whatever you may need. Like many others, my family and I traveled to Cebu for vacation. There are many tourist attractions available in the beautiful city of Cebu. Whether you are in Cebu to roam the city, explore historical landmarks, or swim with whale sharks in Oslob, the Quest Hotel is a great choice to come home to after a long, tiring day. The hotel is beautifully decorated. There were many Christmas decorations placed all over the hotel. The atmosphere of the hotel will brighten the mood of anyone even the Grinch himself. Housekeeping staffs are fast and thorough. In addition, the entire staffs of the Quest Hotel & Conference Center are unbelievably hospitable. The hospitality that this hotel offers puts many five star hotels to shame! From the moment you walk up to the door to the moment you leave, the entire staffs go the extra mile to make you feel comfortable and safe. If they see you, they will greet you with a bow. What is more staggering is that they never fail to greet you even if you are just walking down the hallway. 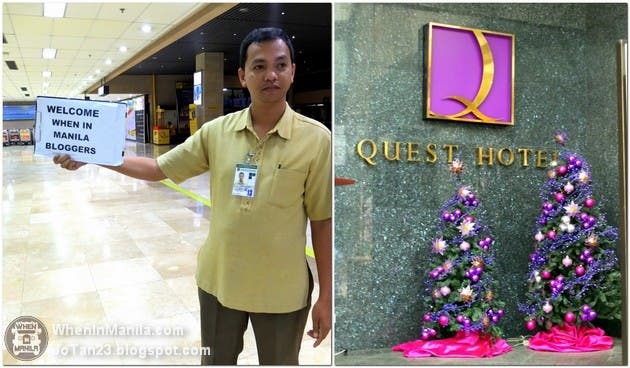 Furthermore, the staffs of the Quest Hotel always have a genuine smile on their faces. Without a doubt, the staffs of the Quest Hotel & Conference Center are very well trained and focused at giving great service to all of their guests. Do you have a bad back like I do? Don’t worry, you will not need to lift a finger when it comes to carrying your luggage. The staff will automatically do it for you whether you are checking in or checking out. Also, there are guards, metal detectors, and canines right at the door to ensure the safety of all of their guests. If what I have told has not convinced you yet to stay at the Quest Hotel & Conference Center, then the Puso Bistro and Bar will surely change your mind. The Puso Bistro and Bar is located inside the Quest Hotel. It is an all-day dining restaurant. You can try international cuisine in a la carte or buffet setting. All Day Breakfast? It’s Possible at the Early Bird Breakfast Club! 5 Funny but Powerful Tips to Move on from a Heartbreak through Travel!